As temperatures warm up, many people make plans to go fishing or swimming in Kansas’ farm ponds. Ponds can serve practical and recreational purposes, but they aren’t as useful or as aesthetic when they are cloudy or muddy. Turbid or murky waters can be caused by chemical or environmental issues. They not only are eyesores, but may also be dangerous to swimmers due to unknown debris hidden under the water. Turbid waters also alter the environment for fish and other aquatic animals, said Charlie Lee, K-State Research and Extension wildlife management expert, who has some helpful tips for improving water visibility. The most common cause of a turbid pond, Lee said, is suspended particulates in the water; the most common particulate found in ponds is clay. Many factors determine if the particulates in a pond will settle on their own over time, including variables such as water temperature, water chemistry, water movement and wind. According to Lee, there is an easy test to determine what causes a turbid pond. Simply dip a gallon-sized glass jar into the water, and then let the jar sit on a shelf for 24 hours. If the particulates settle at the bottom of the jar, the problem is not due to a chemical imbalance. There is something else causing the particulates to be suspended in the pond. Long-exposed clean pond banks also increase the impact of wind erosion and turbidity, he said. The type and quality of the vegetation in the watershed immediately upstream from the pond should be evaluated. 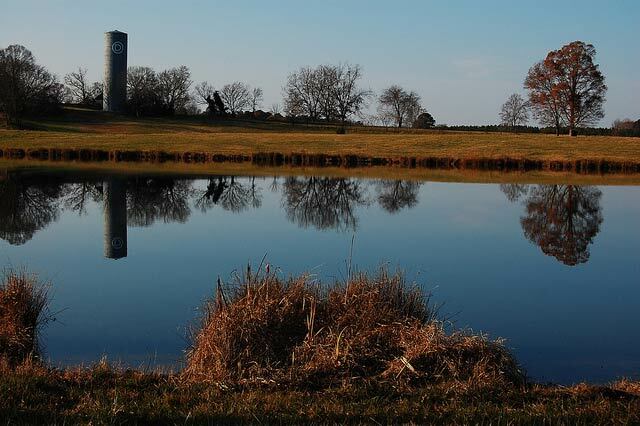 If cropland is near the watershed, heavy rains could wash soil particulates into the pond. Planting a riparian buffer of vegetation around the pond could solve the problem. Other times, the cause of turbid waters is chemical in nature, Lee said. The chemical imbalance is often caused by repeated runoff into the pond from unprotected areas in the watershed. As a result, the interaction between soil type and water chemistry does not allow the clay particulates to settle to the pond bottom. Lee noted that the two main treatments for a chemical problem, gypsum and alum, have been used many times with success. Gypsum is a neutral salt and does not alter the pH of the pond, while alum can alter the pH but is more effective in settling clay particulates. Lee said that the old-fashioned home remedy of putting hay into the pond usually does not work. In fact, putting more organic matter in the pond often leads to more problems. Once the hay begins to decompose, it lowers the pond’s oxygen levels, which can create fish kills. The best form of prevention is placing the pond in the proper spot. Lee recommends those thinking of building a pond to position it in a way to help with its ecology. Placing the pond in a watershed in a rangeland or woodland situation is better than one in cropland. If placing the pond in a cropland situation is unavoidable, a riparian or grass buffer should be planted around the pond. For more information, visit any local extension office in Kansas.